The bridal event for this weekend is Power Weddings Year 4, a fair organized by Angel’s Wink. Yesterday, I wasn’t able to leave work until about half past six (My job requires me to be at work all day from Monday to Saturday). I knew that the fair was supposed to close by eight. I had just a little over an hour to get to Makati coming from Ortigas, and browse the entire fair. I was having a mini debate in my head if I would even be able to make it. The overeager-bride-to-be in me overpowered all logical thinking, so I threw reasoning out the window and decided to go with the flow. Lo and behold, I got to Rockwell in less than 15 minutes. Entering the tent, I realized why their tag line said “Coziest Bridal Fair.” The venue was pretty small, and I was surprised that it was able to hold supposedly over 70 exhibitors in there. And because it was already pretty late, there were already several stalls that were left unmanned. But it was still definitely worth it, if only for two things, which I encountered upon entry and upon exit – The W@W Wedding Primer and the Limo Beetle. UPON ENTRY: The new w@w Wedding Primer is awesome! I have two editions of the Primer (2003 – Maiden Issue and 2007). The designs of the two were very similar, with the cartoonish graphics and pastel colors. But the latest Primer is so different. 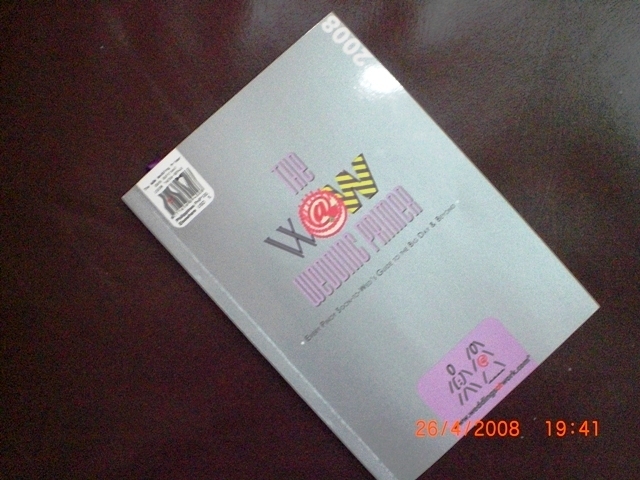 The cover design is edgy with a platinum-hued cover, less graphics, and more impact. It was the thickest Primer by far, and had so much information in it about everything Weddings! Dorky as it may sound, it was cool to see that the response I sent in was actually included, and that I sort of knew the other people who were quoted in the book as well. UPON EXIT: Back in the day, any white Mercedes Benz can be considered a wedding car. But these days, that simply won’t do. Many couples are now exploring other automobile options that will add to the feel of their wedding – whether it’s traditional, vintage, or unconventional. There are a number of couples opting for a cute white VW Beetle although not many companies have this kind of car meant to be rented for weddings or such other occasions. 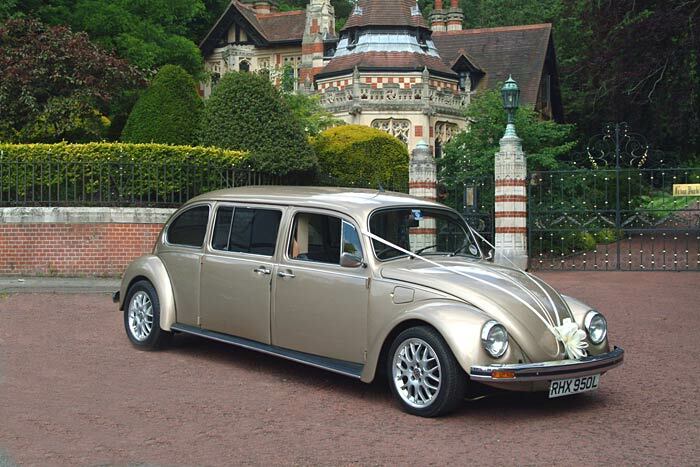 But last night, I found the ultimate bridal car for Beetle fanatics – the LIMO BEETLE. You read that right – a LIMO BEETLE. Restored and customized by Orlina Atelier, the Stretched VW Beetle is a 1973 model, with leather trimmed interiors, power window limo partition, dual airconditioning, 10″ DVD Player, and Blaupunkt surround-sound system. (The photo above isn’t the actual Limo Beetle being offered for hire by Orlina Atelier, but it was the closest I could get to it.) Orlina’s Limo Beetle was featured in Inquirer’s Lifestyle pages, and has been part of major Trans Sport Shows in the country. For interested Beetle Fanatics, you may contact Naesa Orlina at 63918.6424562, NingNing Orlina at 63917.8805108, Tel: 632.781.5918, Fax: 632.749.6439, Email: orlina@pldtdsl.net. For a complete list of wedding-related events such as fairs and expos, please refer to the Events Page/Tab of Storybook Wedding. It wasn’t the first I’ve been to, but it was by far the biggest. The Wedding Expo by Themes & Motifs held at the PICC Forum brought together most of the major players in the wedding industry. Discounts, freebies, and all kinds of promotional gimmicks were abound. It was the best time to reserve suppliers, because most of the promos exclusive to the fair were excruciatingly tempting. I, however, came only to look, not to book. I had the leisure of time, which I chose to spend wisely. At a previous fair, I had already made arrangements with my selected suppliers who were in-demand, whose schedules I had to take into consideration, and whose price increase I wished to be shielded from – the photographer, videographer, and makeup artist. The others such as the caterer, I decided, could wait a bit longer because I wanted to get the opinions of other people who mattered to us, particularly our parents. Because my Sweetie lived several oceans away, I usually visited the fairs with my Mother. For the Expo though, I decided to ask along my fiance’s Mom, who very gamely agreed to keep me company. We brought along my Sweetie’s little sister, who I considered my lucky charm: At The Wedding Library’s booth, she “picked” a prize and won for me a garter. Later on, at one of the hourly raffles, I was announced one of the winners of a pair of gold pearl earrings from Karat World. We visited the Expo on its last day. Knowing it would be at its most crowded, I came prepared wearing my trusty comfy flats. 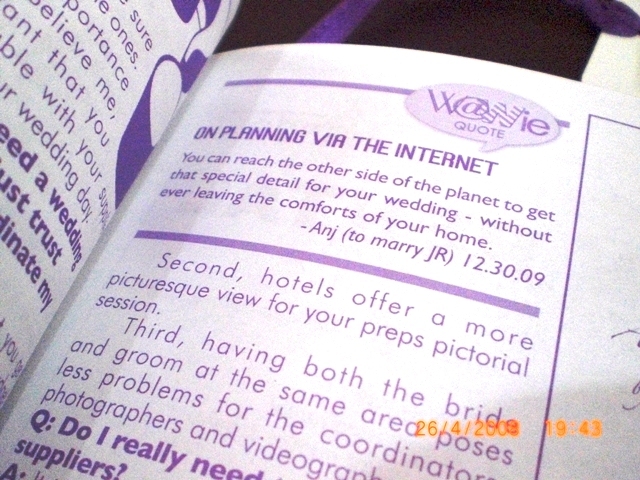 To save time, I had a ready stack of sticker strips with our computer-printed details – name, wedding date, church, and contact details – to put on the registration pad of the participating suppliers. Little sister was more than happy to be in charge of sticking one on each and every supplier’s guest book. The suppliers as well, seemed both amused and impressed by the stickers. Just days after the event, I received numerous updates from various companies, telling me about their products and services, which I welcomed heartily since I actually liked receiving them. We spent hours at the Expo, making sure to check out each stall, ask the essential questions briefly, and keep all brochures, flyers, and papers handed out to us. 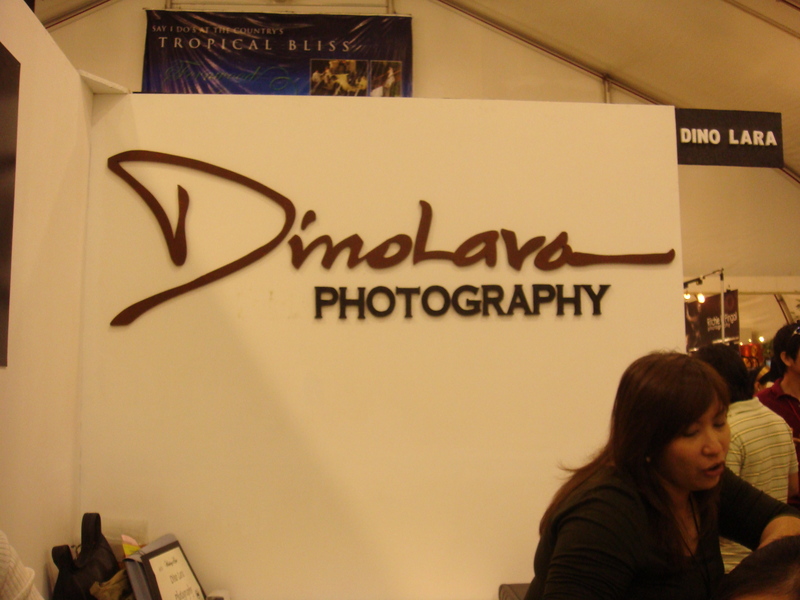 We visited the booths of Dino Lara Photography, Threelogy Digital Video, and The MakeUp Studio, just to say a quick hello and leave some sort of impression to be remembered at least. We also checked what they were offering and I was surprised to find that most had already increased their prices. I was thoroughly relieved and felt sufficiently justified that I had booked them much earlier on. The food-tasting invitations I received from a couple of caterers were godsend. Because we had spent practically half a day at the Expo, we were able to utilize the invitations for a late lunch and early dinner. We first tried Juan Carlo the Caterer and went to Josiah’s Catering after another few hours of roaming the stalls. We were also able to talk to other participating caterers such as K by Cunanan whom I had been eyeing because of their consistent good reviews I’ve been reading. 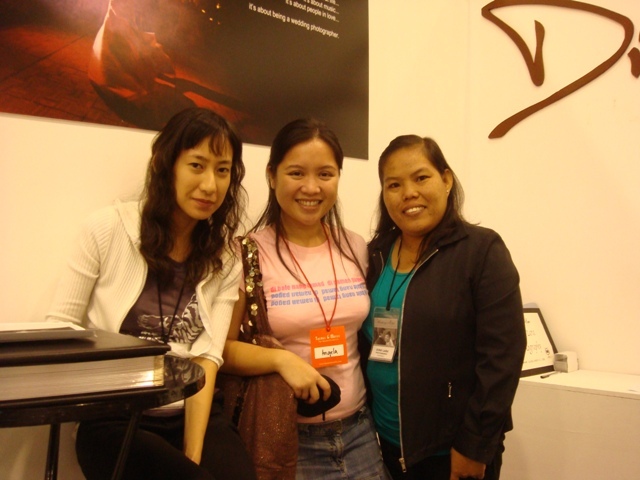 From the Expo, I was able to get a feel of the food, services, and styling of many caterers, which allowed me to be more open to a variety of different options. I came home with three paper bags filled with brochures and paraphernalia from hundreds of wedding suppliers. 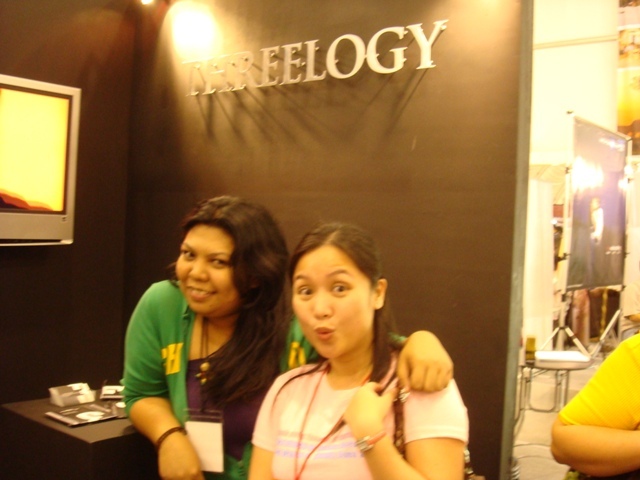 Though I hadn’t booked any company from the Expo, it was still such a fruitful trip – I was exposed to a myriad of fresh ideas and latest trends, my fiance’s Mom was able to understand more the present planning process in weddings and share her ideas with me, and I (further) bonded with my fiance’s family. I can’t wait for the next bridal fairs – That’s right. I will attend them all!